The second-ranked UVa. baseball team scored twice in the seventh inning to rally and top Virginia Tech, 2-1, Friday evening in the opener of a three-game ACC series at Davenport Field. Nate Irving (Jr., Yonkers, N.Y.) hit the tie-breaking single in the seventh inning to lift the Cavaliers (21-4, 8-2 ACC) to win. UVa’s bullpen worked 2 2/3 scoreless innings in support of starter Nathan Kirby (So., Midlothian, Va.). Whit Mayberry (R-Sr., Alexandria, Va.) tossed 1 2/3 innings to earn the win and improve to 2-1, while Nick Howard (Jr., Olney, Md.) pitched the ninth inning to claim his seventh save in as many opportunities. Kirby recorded his seventh straight quality start, pitching 6 1/3 innings and allowing a run, four hits and a walk with five strikeouts. 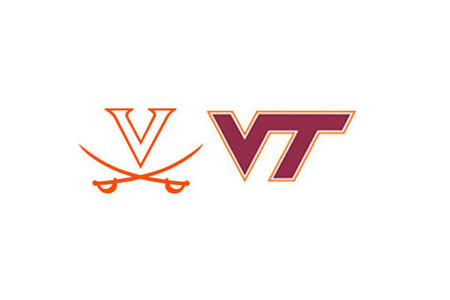 Virginia Tech starting pitcher Brad Markey (2-4) tossed seven strong innings, giving up two earned runs, six hits and no walks while striking out four in taking the loss. Mike Papi (Jr., Tunkhannock, Pa.) went 3-for-3 with a pair of doubles, recording half of the Cavaliers’ hits on the evening. Virginia Tech (12-10-1, 5-5) scored its lone run in the third inning when Ricky Surum singled home Tom Stoffel, who singled to lead off the inning, stole second and moved to third on a throwing error by Irving. The Hokies threatened to extend their lead in the sixth inning, loading the bases with one out. Sean Keselica hit a slow grounder to second, but Branden Cogswell (Jr., Ballston Lake, N.Y.) and shortstop Daniel Pinero (Fr., Toronto, Ontario) turned a slick double play to end the inning. After Markey shut the Cavaliers out on just three hits over six innings, Virginia broke through with a pair of runs in the seventh inning. Papi cranked the first pitch to right-center for a double. He moved to third on a Howard sacrifice and scored when Joe McCarthy (So., Scranton, Pa.) singled to right. With two outs McCarthy stole second base and he came home on a single to left by Irving. Surum tripled off the wall in left-center field with two outs in the ninth, but Howard bounced back from a 2-0 count to strike out pinch hitter Andrew Mogg to end the game. The series continues at 1 p.m. Saturday. Parking will be available in the University Hall, John Paul Jones Arena and McCue lots as well as the Emmet-Ivy Garage. The JPJ lot must be vacated by 5 p.m. on Saturday because of an event at the arena that evening.